No, your users' videos are not getting sent through Clipchamp's servers and we never have access to them in any way. 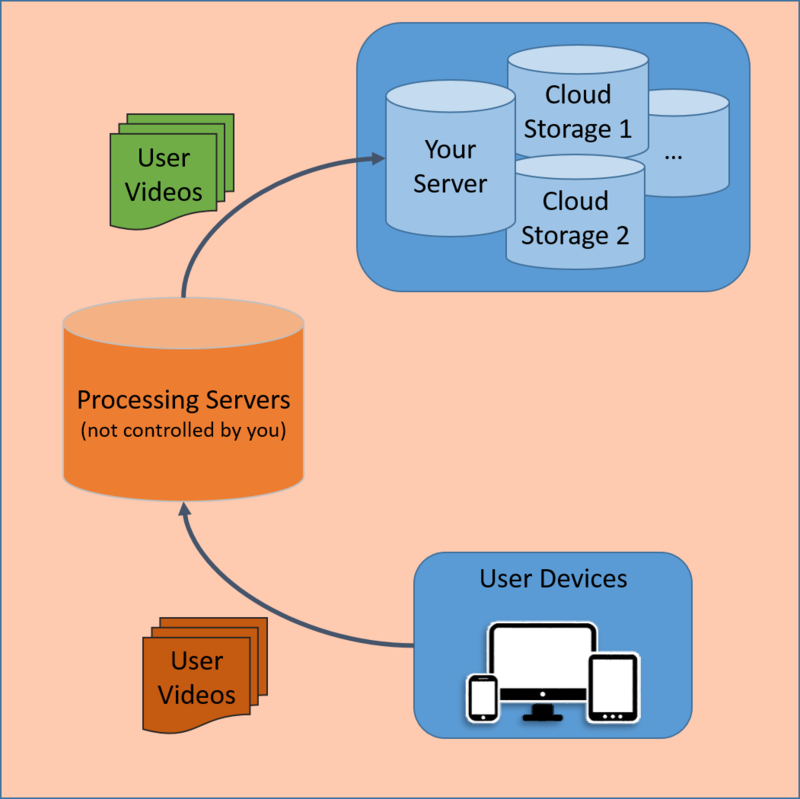 Videos get sent from your users' devices straight to whatever cloud storage solution or server you set up as the destination for uploads. This is the case for the Blob output - which is a purely client-side handling of the output video that requires you to take care of the upload process - and it is also the case for automatic uploads for instance to your YouTube channel, Google Drive, AWS S3 or Microsoft Azure if you've set up one of these options. 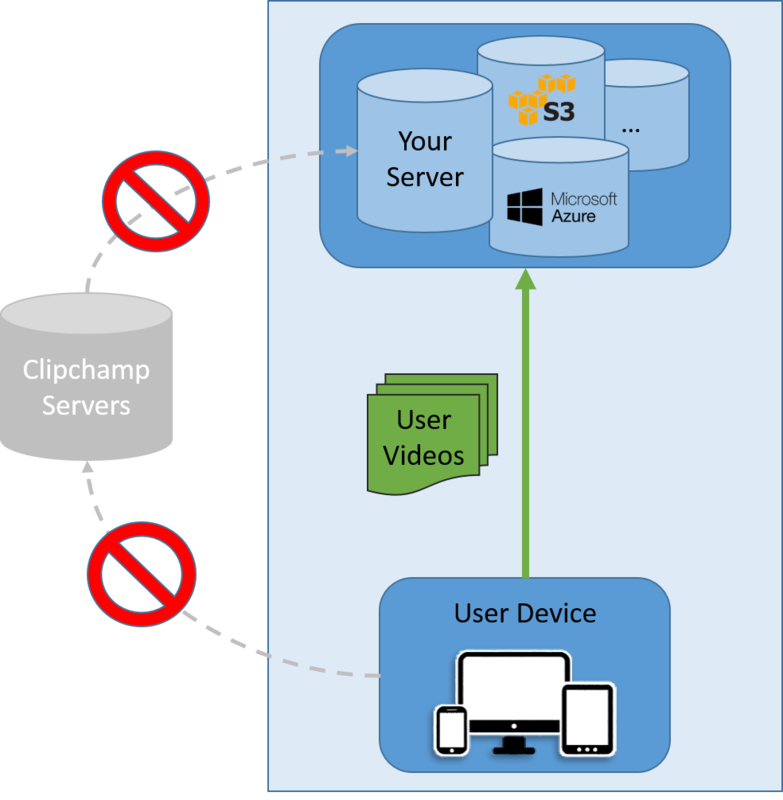 The Clipchamp API directly sends the videos from the client into your account at the cloud storage provider and without taking a detour through Clipchamp servers. If you embedded a webcam recorder on your site, any videos your users recorded were not sent directly to your servers or your cloud storage but to the recording app provider's data centres to process the videos there and subsequently push them on to you. Some providers also offered video file hosting, which added an additional element to your existing infrastructure that required an additional integration to get access to your users' videos. In particular in areas such as online dating, health, recruiting, education, government services, defence, or media where protecting copyright and consumers' privacy is crucial, user video files should ideally never get processed on 3rd party servers. However this is what's happening with any online webcam provider or video uploader available. Except Clipchamp. Using our API, it's within your control as the website or web app owner to decide where your users' video files get sent to straight from their device - for instance making it possible to help with compliance with European Union data privacy regulations (post safe harbor) by not sending EU citizens' video files into data processing centers in jurisdictions outside of the EU. In the health care space, the Clipchamp API can help to comply with aspects of HIPAA and similar privacy requirements to protect personal health information by controlling where users' videos get processed and stored. In the education sector, edtech providers are required to ensure their software complies with regulations such as COPPA - the Clipchamp API can make it easier for them to let students create videos and upload them without any detours through 3rd party servers.